I loved the original Smart Start. When it first came out, the flakes were really light, airy and crunchy... almost a hybrid between a rice krispy and cornflake... a blend of all the cereals I loved. But then... they seemed to change the recipe. Though I still like it, it's not nearly as good. This new variety is a perfect example. Now, the flakes are basically just like plain bran flakes. The maple flakes have a real muted maple sweetness. It's almost as if you weren't told it was maple, you'd just think it was sweetened. They seem to keep cutting back on the oat clusters... especially in this cereal. You can hardly find them in your spoon. That said, it's still a good cereal. It stays nice and crispy. The sweetness is just right even if it's not very flavorful. If you like Wheaties, this is a good upgrade cereal. If you're looking for an interesting new cereal that's loaded with fun stuff, try something else. Would I buy it again? Yes... but only if it was $2.50 a box or less. Short Review By Mr Breakfast: For the most part, I agree with the review above. The first bite I tried had a burned flavor... more like smoky sugar than maple. That initial impression goes away after a couple bites and the cereal is just kind of boring. As for nutrition, it's great: a 1 and 1/4 cup serving (with 1/2 cup of fat-free milk) has 270 calories, 0 trans fat, 5 grams of fiber and 15% to 30% of the usual vitamins and minerals usually listed on the side of a cereal box. Want a better new cereal? Try Grape-Nuts Trail Mix Crunch from Post. 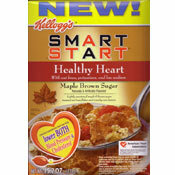 What do you think of Maple Brown Sugar Smart Start Healthy Heart? I have been looking for Smart Start with brown sugar for months only to find out today that it's discontinued. This cereal was THE BEST. Bring it back. I think this is a wonderful tasting cereal. I can't find it any more. It is such a shame if they have taken it off the cereal isles at the grocery and discontinued it. 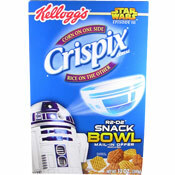 I used to buy this cereal every week. The grocery store, publix, said it's been discontinued. Is this true? Excellent product in Maple flavor but I can't find it in stores. Best tasting "healthy cereal out there". I'm not much on healthy stuff, but I liked this.